If you have kids, they probably love playing Angry Birds as much as you do. Picking up one of these should get you your iPhone back for a few hours. 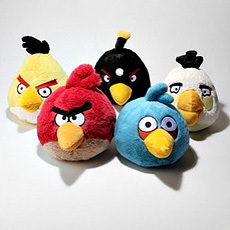 The Angry Birds plush figures, based on the oh-so-popular video game, feature your favorite slingshot-flung feathered friends. Unfortunately there aren’t any pigs available to hurl them at.